A smiling Sebastian Vettel survived a high-speed spin before topping the times ahead of Ferrari team-mate Kimi Raikkonen in Friday’s crash and rain-hit second practice for this weekend’s Italian Grand Prix. 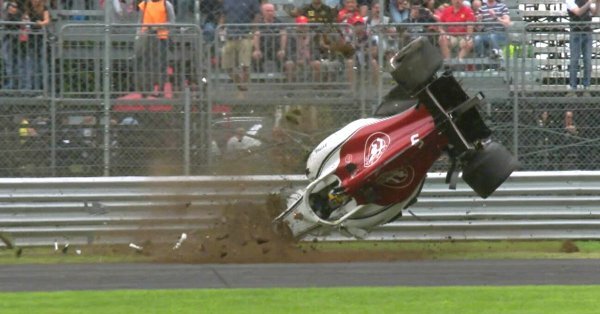 The German clocked a best lap of one minute and 21.105 seconds to outstrip the Finn by two-tenths of a second at the high-speed Autodromo Nazionale where, in the opening minutes, Marcus Ericsson walked away unhurt from a huge high-speed accident in his Sauber. “I don’t know what happened with Marcus,” said Vettel, who had missed much of the morning session to change his gearbox. He was more light-hearted about his own escape when he spun off at the Parabolica later in the session. “I thought I managed it without touching, but I had a slight touch so we broke a little bit the rear wing end-plate which we had to change,” he said. “I wanted to run, but we had to check the car first. It was good that we got out this afternoon. I lost a bit of time with my spin, but I was trying a bit too hard. He conceded he ended up with gravel in his cockpit, adding: “The car was fine so at least I got out of the sandpit, which was difficult for me as a child, but nowadays I don’t want to spend much time there. Championship leader Lewis Hamilton, 17 points ahead of Vettel, was third fastest for Mercedes, four-tenths ahead of team-mate Valtteri Bottas and the two Red Bulls of Max Verstappen and Renault-bound Daniel Ricciardo. Esteban Ocon, whose future remains uncertain, was seventh ahead of his Force India team-mate Sergio Perez, the Mexican unable to repeat his session-topping performance from the morning for the re-born Silverstone outfit. Charles Leclerc was ninth for Sauber, having also had problems, like Ericsson, with his Drag Reduction System (DRS), ahead of Nico Hulkenberg of Renault. The session, run in dry conditions after overnight thunderstorms and heavy rain, was overshadowed by the spectacular accident that wrecked Ericsson’s car. The crash happened as Ericsson approached the chicane, having accelerated to close to 350 kph. The Drag Reduction System (DRS) on his Sauber’s rear wing remained open as he braked, perhaps causing the lurid swerve and massive impact. His car snapped sideways into the barriers, spinning wildly and then rolling several times in a spectacular arc before slamming to a halt. It resulted in the session being red-flagged to a halt for 20 minutes. Ericsson was helped from his car, apparently uninjured, and taken to the medial centre at the Autodromo Nazionale Monza. While the track barriers were repaired during the stoppage, Ericsson was seen leaving the medical centre and walking back down the pit lane to the Sauber garage. He gave a thumbs-up signal and waved to the cheering crowd. As the leading teams became accustomed to the conditions, on ‘dry’ slick tyres, the usual suspects took control, Vettel leading the way ahead of Raikkonen and Hamilton. Vettel, pushing on a set of super-soft tyres that had done 10 laps already, spun off at the Parabolica. He managed to keep the engine running and escape from the gravel trap, steering his Ferrari back down the pit lane.